Here's another look, in GIF form, thanks to Google Developers. A Googler reached out to clarify that these controls work without the use of service workers, appearing when the browser detects audio or video content that is longer than 5 seconds within <audio> or <video> tags. This feature utilizes service workers, which were introduced in v40 and help make web apps work better offline and act more like full-fledged applications rather than mere webpages. v45 introduces several other minor improvements to service workers that are oriented towards web developers rather than user-facing changes. 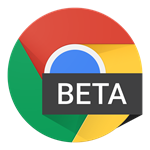 The Android version of Chrome Beta v45 should be rolling out any day now. Keep an eye on APK Mirror for the release if you're impatient.